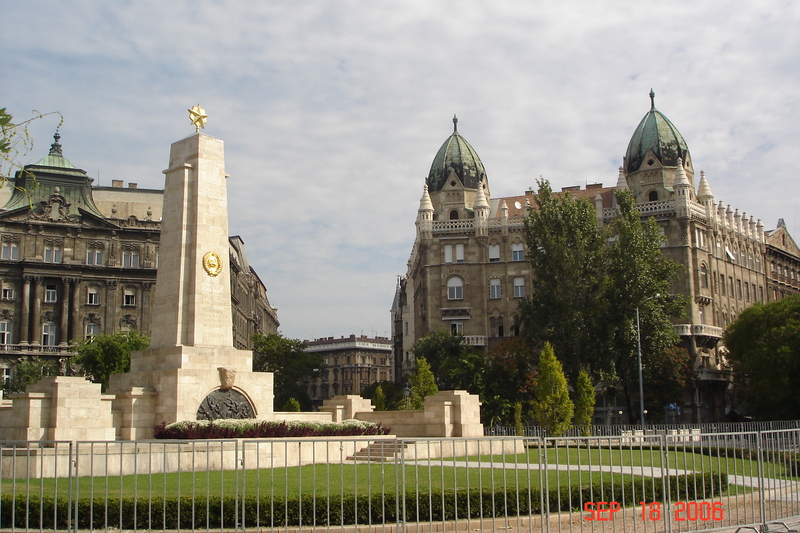 All over Pest, there are beautiful, open squares, usually with a monument to a local hero at their heart and always with a story of some great struggle, victory or opus. Szabadsag Ter, in quiet, quaint Leopold Town, has a children’s park, bright beds of flowers and a star-crowned monument to the heroes of the 1956 uprising. It is overlooked by the majestic Hungarian Television building and the American Embassy, where the rebel Cardinal Mindszenty lived in exile between 1956 and 1971. 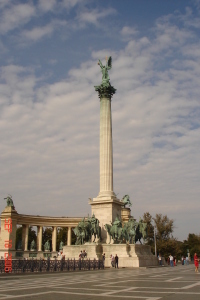 It’s a fair hike from Szarbadsag Ter up a busy boulevard, through the whirling traffic on Oktagon Ter to Heroes Square, but it’s worth it to see this huge, powerful, sculptural extravaganza. Built in 1896 to commemorate the conquest of the Carpathian Basin by the Magyars, it depicts the Archangel Gabriel surrounded by the tribal chiefs, with Arpad in the centre. 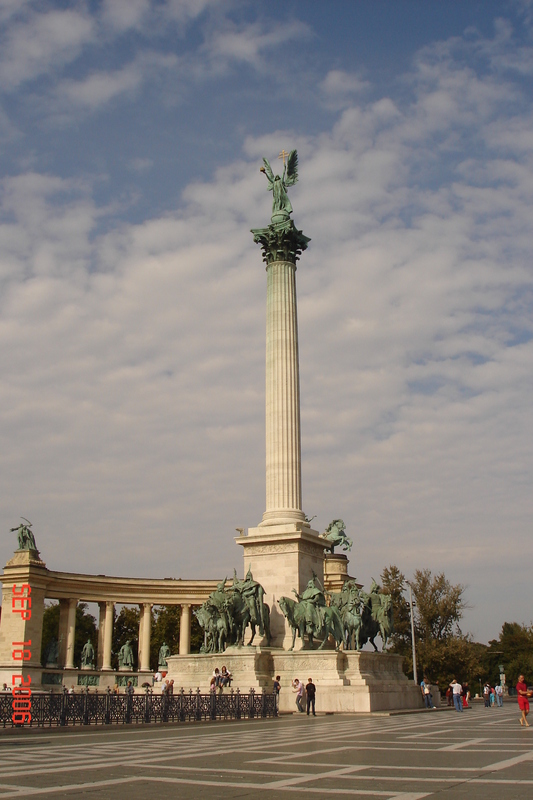 The tomb of the Unknown Soldier lies at their feet and behind it are the Kings, statesmen and heroes of Hungary. 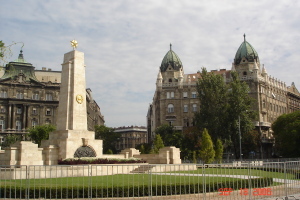 In front of the monument, a vast, white flagstoned square stretches away. The Museum of Fine Arts stands on the left of the square and on the right is the Mucsarnok which houses temporary modern exhibitions. 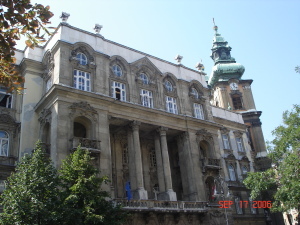 Budapest’s Great Synagogue, which stands on the corner of Museum Korut and Racoczi Ut, was built in the 1850s by the Viennese architect, Lugwig Forster. A huge, ornate turreted construction, it is a testament to the large, thriving community that existed in Budapest in the 19th century. A museum in front of the building shows Jewish life as it used to be before the Holocaust. Behind it is a memorial, a metal weeping willow, its leaves inscribed with the names of those who died. 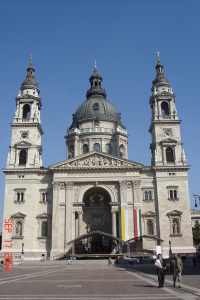 Majestic St Stephens Basilica, is one of the masterpieces of the architect Moklos Ybl. 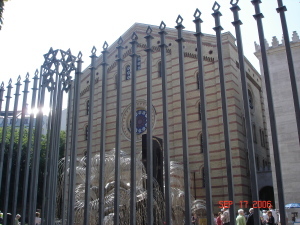 It was begun in 1851 and finished between 1873 and 1905 by the architect Moklos Ybl. The mosaics in its giant 96 metre dome are by Karoly Lotz and the figure of St Stephen on the high altar is by Alojos Strobl. The church treasury is home to one of the most precious relics of the Catholic faith – one of Saint’s Stephen’s mummified hands.